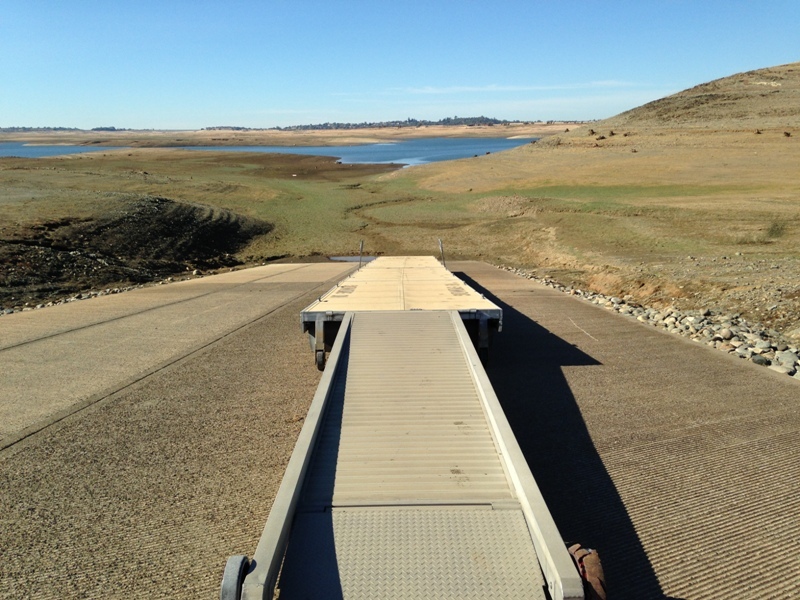 The boat ramp at Folsom Lake on November 12, 2015. The lake set a new record low of 140,523 acre-feet in November 2015. The previous record was 140,600 acre-feet in November 1977. The report also shows that moderate and severe drought was reduced slightly in northeast Nevada, but there were no changes in the drought intensity for the rest of Nevada or California. California remains 92 percent in severe drought, 70 percent in extreme drought and nearly 45 percent in exceptional drought. The U.S. Drought Monitor intensity levels are Abnormally Dry, Moderate, Severe, Extreme and Exceptional Drought. After four years of drought, ski areas in California and Nevada welcomed the snow, with many areas opening earlier than planned. Sierra-at-Tahoe, in Twin Bridges, is opening Friday, Nov. 20, the area’s earliest start in 11 years. Many other Sierra ski resorts are already in operation. But the drought update released Thursday says that snow doesn’t ease the water supply deficit, or add water to dwindling reservoirs, after four years of drought in California. "The northern coast of California and the Sierra Nevada received half an inch to an inch of precipitation this week from Pacific systems, with California’s Central Valley and portions of western and northeast Nevada receiving 0.25 to 0.50 inch of moisture," the report noted. "This was enough to increase snowpack a few inches at some SNOTEL stations in the Sierra and northeast Nevada," according to the update. "While the precipitation was beneficial to surface soil moisture, it had no effect on the long-term hydrological situation." The update pointed out that "in some areas, river base flows have not increased and groundwater and reservoir levels have not rebounded. Additionally, a well recently went dry in Cazadero (Sonoma County) in one of the typically more wet environments of northern California (coastal redwood forest)." 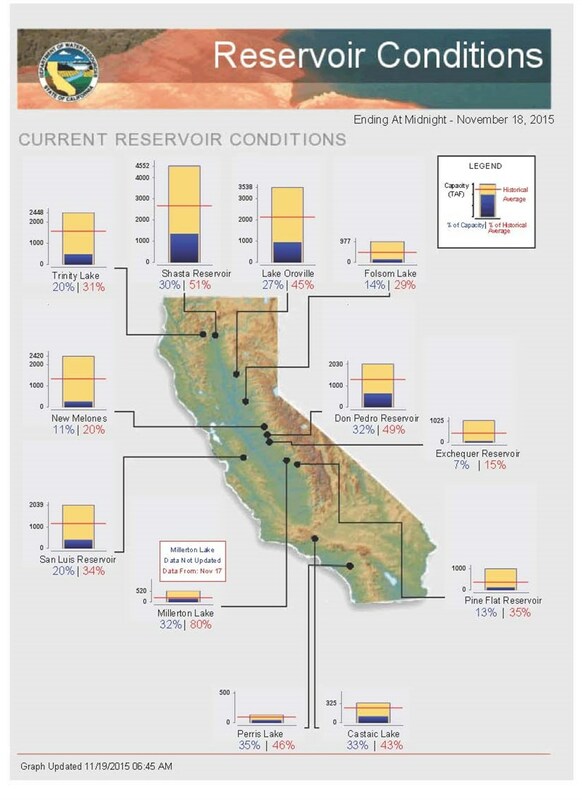 "As noted by the U.S. Department of Agriculture, California statewide reservoir statistics (from the California Department of Water Resources/CDEC), updated through the end of October, show that this year’s preliminary reservoir withdrawal stands at 6.92 million acre-feet," the update reports. "This is just 84% of the historical average. Conservation is working, but storage is still precariously low, at second-lowest on record for this time of year, ahead of only 7.53 million acre feet on October 31, 1977." In the Pacific Northwest, several days of "onshore flow wrung out abundant Pacific moisture along the coasts of Washington and northwestern Oregon, causing contraction of drought west of the Cascades." The most dramatic improvement came in Washington state, where the level of moderate drought was reduced to 72 percent from 100 percent the previous week. Nearly 61 percent of Washington is in severe drought and 48 percent is in the extreme category. Oregon is 98 percent in moderate drought, 91 percent severe and 61 percent extreme. The latest U.S. 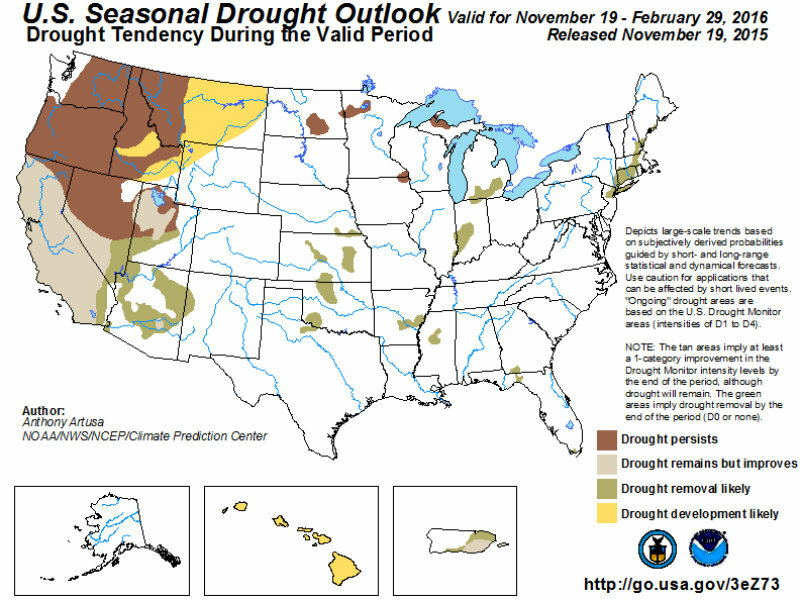 Seasonal Drought Outlook, released Thursday by the NOAA/NWS Climate Prediction Center, shows "drought remains but improves" in California through the end of February 2016, and "drought persists" in northern Nevada, Oregon, Washington and Idaho. 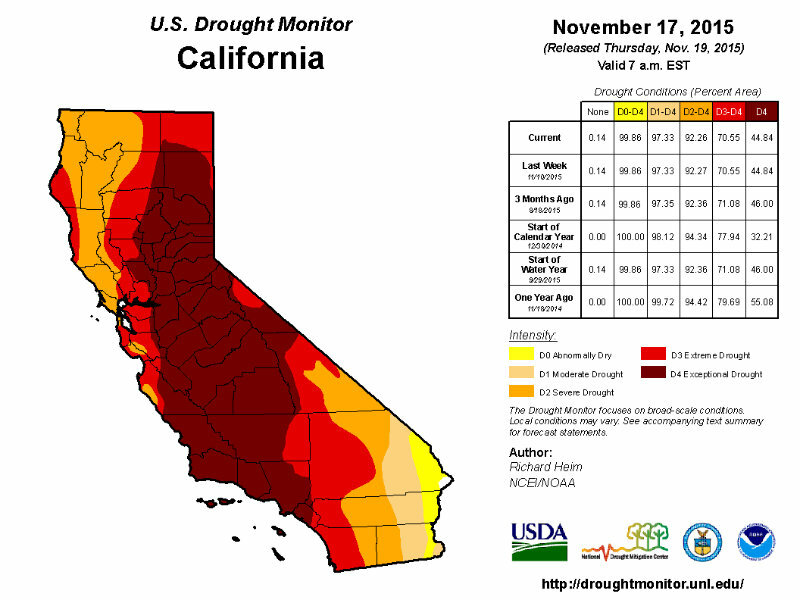 The latest U.S. Drought Monitor shows that "exceptional drought" has been reduced in Northern California. But, wells, reservoirs, ground water, and soil moisture are all recovering slowly. The recent snow and rain help, but more is needed as California heads toward a record fifth year of drought. The North Lake Tahoe Fire Protection District is expected to continue a "prescribed fire" operation this week at Incline Village. Despite a return to a more typical fall storm pattern, the rain and snow has brought only minimal improvement to California's multiyear drought. 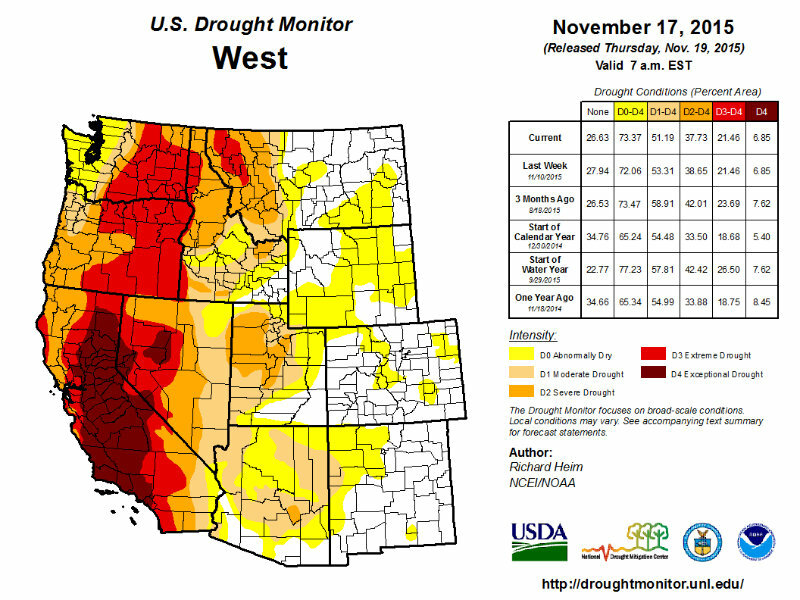 The Pacific Storm system brought some slight improvement to drought conditions in California and Nevada last week.